As we all struggle to save more money, we use more coupons. So let’s be cautious. There is ABSOLUTELY nothing wrong with USING coupons. It is a way of life for my family. I am writing this article to bring knowledge to the fact that Coupon fraud does exist. Coupon fraud is seen more with the use of printable coupons. Let’s first examine the anatomy of the printable coupon. By recognizing the basic concepts found on a printable coupon you can learn to recognize a false (or illegal) Coupon. How do we know if we are using false coupons? Simple, sometimes we just don’t know. There are some simple key facts to help. 1) Watch for “HIGH” Value Coupons. Usually more than the cost of the product. More than likely this coupon is really too good to be true. 2) Manufacturers WILL NOT send coupons for FREE Products via e-mail. If you receive an e-mail with this type of coupon, please be vigilant. They will usually mail FREE coupons to your home. This is where we find the most coupon fraud occurring. 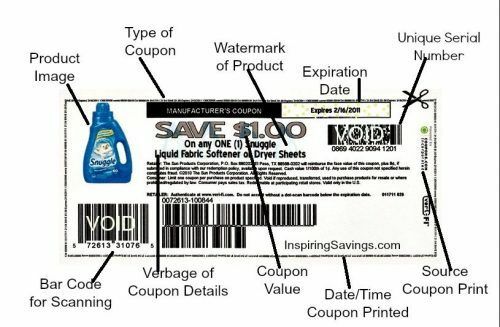 Knowledge is key to knowing about the coupons you are using. Please remember that a coupon is a form of payment to the store and not a discount. Stores don’t get reimbursed for fraudulent coupons. 1) Watch the verbiage of each coupon. If it says, valid on only the 11.5 oz. box do not try to use it on the 15 oz box. or If it states valid only in the following states or stores please make sure your state or store is listed. While the coupon may work, without the cashiers’ knowledge, and the register doesn’t set off a little beep, it is STILL illegal to use it. 2) Don’t intentionally use expired coupons. I have actually heard of people cutting off the expiration dates and the cashiers will sometimes not catch this and it goes through. The store will not be paid for any expired coupons. 3) It is illegal to photocopy ANY coupon. There are lots of security features built into each printable coupon. For instance, each coupon that can be printed at home is given a unique code (see above photo, top right-hand corner.) They may also contain watermarks, yellow dots near the expiration date or specific barcodes. Rule of thumb, each coupon can be printed twice from one computer. If a coupon is photocopied only the original coupon redeemed will be reimbursed back to the store. They will, in fact, lose money (and they do) when coupons are copied. It is so important to know the difference between a good coupon and bad, but more importantly to follow the intended verbiage of each coupon. Penalties for those convicted of coupon fraud-related crimes vary by each case and the number of laws violated. Prison sentences of three to five years are not uncommon. Financial penalties generally vary but have often been in excess of $200,000. This is such an important part of couponing, Knowledge is power ARM UP, coupon safely, and save plenty of money doing it the RIGHT way.